Crochet Plant Hanger is an original crochet pattern by June Gilbank. A modern crocheted take on macramé plant hangers, this is a lovely any-size plant hanger that will work with any yarn, any hook size, and any size of (round) plant pot! You don't need to take any measurements in advance - just hold your work up to the pot as you go, and you can custom-fit it as you crochet (much easier than it sounds!) 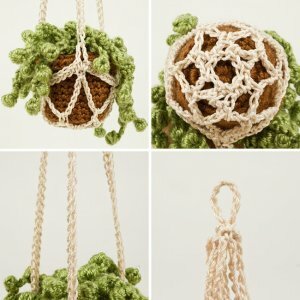 Use this pattern to make hangers for both your crocheted potted plants and for real plants in pots. Note: Looking for the crochet patterns for any of the potted plants pictured in my hangers? The plants aren't included in this pattern, but you'll find them all - and more - in the Potted Plants section of this shop! Size: Any size you wish - you can custom-fit the holder to fit any size of round plant pot! This Crochet Plant Hanger pattern is Donationware - the complete pattern and instructions for the small Crochet Plant Hanger are available to view online for free, but if you like it please consider sending me a donation to show your appreciation, and to receive bonus tips, three options for the hanging loop, and the any-size pattern too - perfect for making plant hangers for any PlanetJune potted plant patterns, or your real houseplants!